Lessons in Shilling: If you are going to hop in a forum, and shill for your generic Midtown deli you probably shouldn't use "good food" as a tag. Or the address. Or the phone number. This short class was free, Cafe Bonjour, but the next one will cost you. This comment by “challahbackgirl” (cute!) 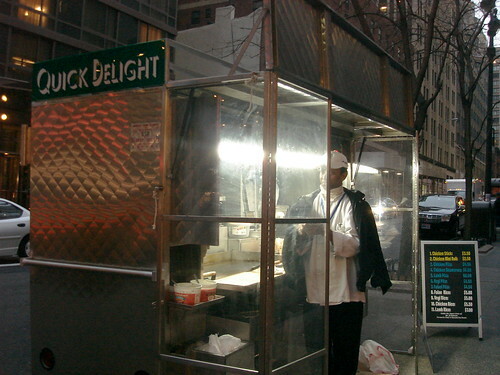 was posted to yesterday’s news about the brand new Frites N Meats Truck (which uses meat from well known butcher DeBragga & Spitler). Notice anything odd about this supposedly unbiased comment from a totally random user? Here’s a tip to all you businesses out there who think “guerilla marketing” should involve pretending to be a regular commenter on food blogs… if you’re going to insult the competition, you might not want to do it from a company computer. Especially if your company mail server has the company name in the URL. (It’s kind of a dead giveaway.) 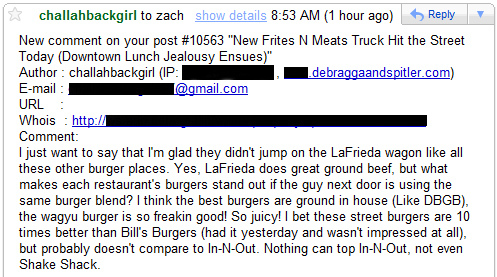 For those who aren’t technically inclined, here’s a layman’s explanation: I love your meat DeBragga, but you’re busted. Posted by Zach Brooks at 2:30 pm, October 29th, 2009 under Shilling. Posted by Zach Brooks at 1:30 pm, March 20th, 2009 under Shilling. Been Caught Shilling: Et Tu Kwik Meal? Posted by Zach Brooks at 11:00 am, February 6th, 2009 under Kwik Meal, Shilling. Posted by Zach Brooks at 10:30 am, January 14th, 2009 under Comment of the Day, Shilling. 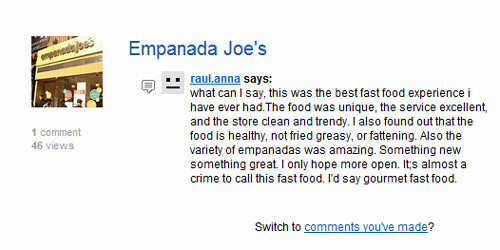 Clearly the shilling from the newly opened Empanada Joe’s (on 8th Ave. btw. 43+44th) knows no boundaries. I got the comment you see above on one of my flickr photos over the weekend. The shilling that happens in the comments of this site is well documented, and Eater makes a point of calling out all shillers on message boards, blogs, and listings websites… but this may be the first time I’ve seen it done in Flickr. Come on Joe. Give it a rest! Posted by Zach Brooks at 1:30 pm, September 30th, 2008 under Empanada Joe's, Shilling.